Designation for the flat and bulbous bottle shape (in brown or green color) in the German cultivation area Franconia, It has been used here for at least 250 years, as a "birth house" is the Bürgerspital in Würzburg, This should give the Franconian wine an unmistakable identity and protect it from counterfeiting. After a Würzburg document from the year 1728 it is to serve the "control of any possible commercial abuses" . The name derives from either "bulbous buddy" or from the "Booksbüdel" (a previously used bag for the prayer book). After a nice anecdote, some winegrowers are said to be busy Benedictine Have bottles that fit right into their prayer book bags. Thus, they could strengthen, unsaid to the "divine drink", to the "prayer retired". According to the most frequently cited variant, the name derives from the scrotum of the goat. The local historian Johann Baptist Sartorius, who was born in Würzburg, declared in his work published in 1862, "The dialect of the city of Würzburg," what a Bocksbeutel is, namely "a pressed, round, shaped after the type of bag or scrotum of the bucks bottle for filling and shipping of stone wine " . Another indication is that in the Middle Ages from the goat leather of the testicles cassettes were made in which the Landser their wine (or liquor) carried. This is shown on a drawing by Albrecht Dürer (1471-1528). The volume of a Bocksbeutel bottle is usually the standard quality wine bottle size of 0.75 liters. However, there are also those with 0.25 liters, as well as in the Magnum size of 1.5 and double magnum size with 3 liters. In the region of Franconia, the proportion of Bocksbeutel bottles is over 40% of the wines, there is also a wine route named after. 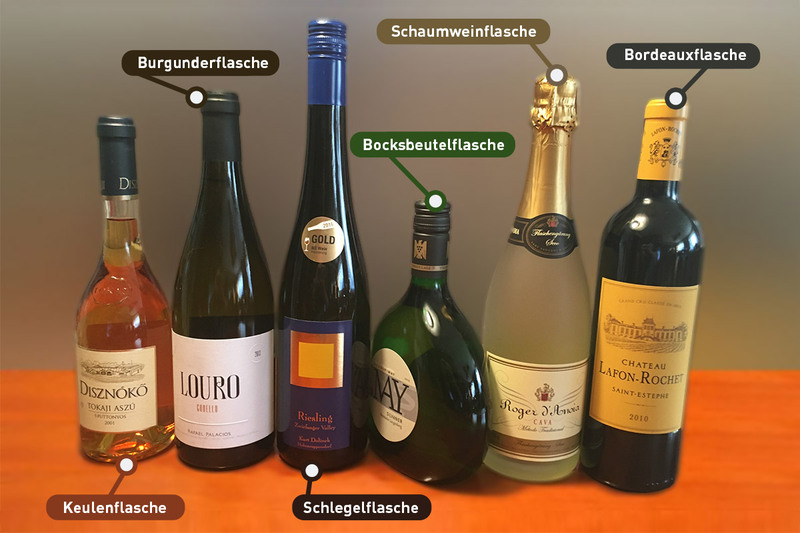 According to German wine law, the protected Bocksbeutel bottle may only be used in precisely geographically defined areas exclusively for quality wines and premium wines (not for wine or local wine). That's the whole growing area Franconia, as well as in the cultivation area to bathe the area Tauberfranken and the four communities Neuweier, Steinbach, detour and Varnhalt in the area Ortenau. This page was last modified at 12 February 2018 at 09:05.